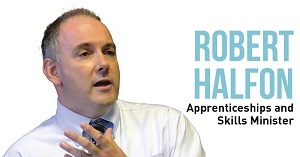 Writing exclusively in FE Week, Robert Halfon, the Minister for Apprenticeships and Skills, sets out his plans, priorities and resolutions for the year ahead. 2017 is set to be a hugely significant year for apprenticeships, skills, further education and careers – building on the successes of 2016. With apprentice participation at nearly 900,000 – the highest figure on record and 625,000 apprenticeship starts since May 2015, we have made huge progress towards Britain becoming an apprentice nation. This year I became Minister for Apprenticeships and Skills and it is not a stretch to say that it is my dream job. Being able to spearhead the benefits of skills and apprenticeships to people across Britain is a great honour. I see apprenticeships as a ladder of opportunity. This is because, like a ladder, people climb to new heights, acquiring the skills and qualifications they need for current and future jobs. Apprenticeships really do work. They give people the chance to earn while they learn, gain vital work experience and set themselves on a fast-track to a successful career for life. Importantly, over 90 per cent of apprentices who complete their programmes remain employed. In terms of skills, our ambition is to create a professional and technical education system that puts skills at the forefront of learning, and also ensures that we have the skills that employers need to move forward. While ‘skills’ is a broad term, what we need to ensure is that all education routes represent quality and opportunity for all. This means ensuring technical courses are on a par with traditional academic options and that every apprenticeship offers the skills employers are looking for. 2017 is the year that the apprenticeship levy is coming into force. For too long there has been an under-investment in Britain’s skills and that is why the levy is so essential – it will help to ensure a highly skilled workforce for the future. Through the levy, £2.5 billion will be invested in apprenticeships by 2019-20, that is double the amount spent in 2010-11. With more money than ever, we will be helping people get into more and better quality training schemes. We are also continuing to help those from disadvantaged backgrounds. Through the levy, we are investing £60 million in supporting the training of apprentices from the poorest areas in the country as well as providing an additional £150 a month for training providers to give extra learning support to an apprentice with learning or other disabilities to ensure social mobility for all. In addition, we are investing in STEM qualifications for apprentices, and giving significant financial incentives to both employers and providers to employ 16-18 year old apprentices and those from disadvantaged backgrounds. Over the last Parliament, we had 2.4 million apprenticeship starts and apprenticeship participation is at its highest figure on record. I want to continue to build on this enthusiasm and momentum this year and reach three million apprenticeship starts by 2020. Quality must sit at the core of all of our changes. We have been working hard to make sure the Institute for Apprenticeships is up and running by April 2017 to ensure just that. Its ultimate goal will be to give employers a stronger role in the apprenticeship system, ensuring they and employees get the skills they need to succeed. Of course, one of the highlights of the year will be National Apprenticeship Week in March. I hope to be traveling around the country alongside the National Apprenticeship Service, seeing some brilliant apprentices across many diverse fields of employment. The week is designed to celebrate the positive impact apprenticeships and traineeships have on individuals, businesses and the economy. With the theme being ‘ladder of opportunity’, this is a fantastic opportunity to showcase the amazing work of employers and their apprentices. There really has never been a better time to be an apprentice – and throughout the week we will be highlighting how apprentices give people a chance to climb up the career ladder and get on in the world of work. 2017 will see the Technical and Further Education Bill continue its passage through parliament. The Bill brings to life the fundamental reforms needed to build a high quality skills system to rival the best in the world. This Bill will extend the role of the Institute for Apprenticeships to cover technical education, expanding the Institute for Apprenticeships into the Institute for Apprenticeships and Technical Education. Subject to passing in parliament, it also protects students in the event that colleges face extreme financial difficulties due to insolvency. Above all, the Institute will ensure that all technical training is of the highest quality and based on the needs of employers. I want 2017 to also be the year we celebrate the brilliant work that further education colleges do. It is right that excellence in further education is now being recognised through the Chartered Institute of Further Education, with Furness College being the latest institution to be accepted for membership. We need to learn from the leadership of the best colleges both in terms of their teaching and their financial acumen. Through the area review process, we have been reforming further education so that local communities, learners and employers get the skills and training they need to help their area thrive. Finishing this year, this process has been vital in supporting colleges to put themselves in the best position possible to deliver high quality teaching which meets the needs of all young people and adults enabling them to succeed. Careers is something I am extremely passionate about – it is the first rung on the ladder of opportunity. Good careers advice and guidance is essential to opening up opportunities and jobs for people of all backgrounds across the country. It is also critical for the success of our reforms to apprenticeships and to technical education which will transform the skills base of this country. That’s why 2017 is all about making sure that the careers advice and guidance on offer encourages people to pursue professional and technical education and apprenticeships as much as it does university. This year I’ll be pushing ahead with plans to ensure that everyone, no matter what age or what background, can rely on excellent and consistent careers advice. Careers advice and guidance should be available everywhere from schools to colleges and universities. The Careers and Enterprise Company will be continuing to support the mentoring and work experience that is essential for careers guidance to succeed, including through their growing network of Enterprise Advisors. Last year their funding supported over 250,000 students, focused in the areas of the country with the least provision. Careers, apprenticeships, skills, social justice, quality and jobs are my priorities for the coming year. The direction of travel is clear; the levy will change behaviour, and the new Institute will ensure quality. The Sainsbury reforms will also guarantee excellent professional and technical education, and the area reviews will help provide strong leadership in further education and strong further education colleges. I look forward to being challenged by FE Week and others as we implement our programme. Whatever our differences in opinion, we are united in the need to ensure we provide the apprentices and skills that our nation needs. Finally, I would like to wish everyone at FE Week and in the Skills, further education and apprenticeships world a happy new year! Apprenticeships should be about new recruits to a job and not for those in work as they are not apprentices as such. Government are not creating jobs but instead wasting money on training employees in employment for many years, this should be responsibility of the employer and offering an apprenticeship to their employees does not improve productivity. There are still examples here in the UK where a training levy provides support for vital skills especially in apprenticeships. the CITB and ECITB invest millions per year in supporting companies with their apprentices.